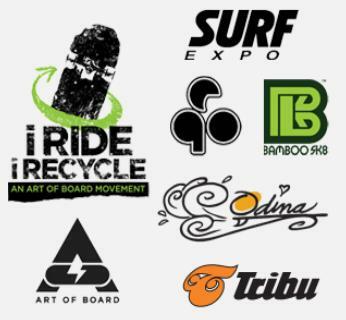 Melbourne Beach, FL – I Ride I Recycle, the FIRST-EVER international skate deck recycling movement is debuting another first for the action sports industry this September 6 through 8, 2012 at the Orange County Convention Center in Orlando, FL – the I Ride I Recycle “Green Zone” at Surf Expo. The “Green Zone” at the global water sports and beach lifestyle tradeshow is a new designated area of Surf Expo this year where a consortium of like-minded, “green” brands have come together under the I Ride I Recycle name to promote sustainable business practices and products ranging from swimwear, flip flops and skate decks to sunglasses and retail surface tile made from broken, recycled skate decks. Started by Bruce Boul and Rich Moorhead, founders of Art of Board, a company that creates hard tile surfaces and retail displays, peel and stick wall graphics and printed textiles from discarded skateboard decks, the movement’s goal is to encourage skate and surf shops, skateboard manufacturers, skate parks and individual riders to join the movement and recycle their wood waste. Tribu, a company that makes sandals from recycled materials will be launching their “Sole Initiative” in the Green Zone. The “Sole Initiative” is an effort to keep used rubber tires out of landfills. Their “Upcycled” line of flip-flops has soles made from discarded tires from landfills. To get this initiative off the ground, they have started a Kickstarter campaign to help raise the money needed to display at the expo and raise awareness of their efforts. To contribute to this cause, please visit http://www.kickstarter.com/projects/627705205/tribu-sole-initiative-sandals-made-from-discarded. BambooSK8, an ecologically based brand/manufacturer of skateboard decks made from bamboo harvested from sustainable managed bamboo forests, will be in the Green Zone at the Surf Expo. “We have supported this movement for a few years and are excited to be at the four front of the expansion of sustainable practices in the skate industry,” says Mark Olson with BambooSK8. For more info, visit http://bamboosk8.com.